Nada Yoga Meditation, Naad Yoga Process, Kundlini Awakening, Process To Feel Real Peace Within, Process to Energize Our Body, Process To Heal our self easily, Way to Success, Science of Naad Yoga, Best way to meditate, Solutions of problems through special meditation technique. Before starting the article i just want to share my own experience that by doing this saadhna only for a short while i have experienced many wonderful feelings which is inexplicable. I just want to say this India is known for it's divine sciences which are the real ways to get success in physical and spiritual world. Without saying more just want to remind you that Truth doesn't need any e.g. Do the process and feel the power yourself. It's a guarantee that If you do this process regularly you will find yourself energetic, powerful, Healthy, wealthy, Positive etc. What is a Naad Yoga? Naad Yoga is a process to energize our body and Mind. It is a process of purification. It is a way to awaken kundlini the spiritual energy within the body. Naad Yoga is also known as Naad brahm saadhna, Gunjan yoga. There are different ways of this saadhna as per understanding. There is no need of any extra things in this saadhna. Naad means sound and yoga means to Union. So this is a saadhna to unite our conscious with the naad i.e. sound. Actually it is said by our rishi munis and yoga scientists that a divine sound is going on within our body which can be heard only at the time of deep meditation. Only by hard practice, by continuous practice, by guru and god grace one can attained the state to hear this divine sound that is 'Brahm Naad' or 'Anhad Naad'. Sounds are of 2 types 1 is Ahad and 2nd is Anhad. Ahad sounds generated by striking And Anhad sound means which doesn't require any strike. It is the universal sound which is going on for the decades within the body. The Anhad sound is to subtle to hear with the physical ear. We have to make our senses more subtle to enter in the divine world, the subtle world of miracles. Now by doing the Naad yoga meditation person is able to create the dream world of naad but it is not useless. It also opens the way to enter into the world of Divine Nada. It work as a key to open that unseen door. This is not a fake just by doing saadhna for a week you can feel the power of Nada yoga saadhna. It is also said in our scriptures that nothing is impossible for the yogi who hears the 'Anhad sound' within. Nada Yoga Meditation, Naad Yoga Process, Kundlini Awakening, Process To Feel Real Peace Within, Process to Energize Our Body, Process To Heal our self easily, Way to Success, Science of Naad Yoga, Best way to meditate. A I said earlier that we don't need any other things to start this saadhna. You can start this saadhna any where, in any condition and at any time. But if if you have the silent place it will help you better. Sit in a comfortable posture. You may use padmaasan, Sukhasan etc and remember your guru, kuldevi and ancestors, Pray For your success. Take long breath for about 5 minutes. Inhale completely and exhale fully. Now relax your body and focus on your self by closing your eyes. Close your ears with thumbs and put the index finger on your eyes. Now take a Long breath(Inhale) and shut your mouth and start uttering sound of Om just by exhaling through nose slowly and slowly. Let the sound of OM surrounds your within from Head to Feet. Do this saadhna for 30 minutes daily Morning and evening. You may increase time as per your convenience. It will open your Nerves. This sounds will full your body and mind with energy. Nada Yoga Saadhna is a very good detoxification process, Through this practice you will be able to over come from the evils easily. Energy will flow from every part of body and make them activate soon. It will increase your memory. Naad brahm saadhna will increase your beauty. Your senses become more subtle to feel the divine world within. 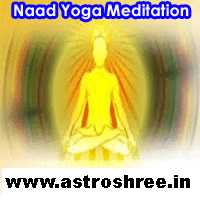 You will be in the state of Happiness and peace for long time after this Naad yoga process. It is a perfect method to awaken the kundlini in long run. So start this saadhna from an auspicious time and day and make your self better. Get the spiritual and physical power by doing this easy Nada brahm saadhna. Nada Yoga Meditation, Naad Yoga Process, Kundlini Awakening, Process To Feel Real Peace Within, Process to Energize Our Body, Process To Heal our self easily, Way to Success, Science of Naad Yoga, Best way to meditate,Solutions of problems through special meditation technique.